A two-year grant from the National Science Foundation has enabled Rosanna Hertz, Class of 1919–50th Reunion Professor of Sociology and Women’s and Gender Studies, to conduct groundbreaking research on how donor-assisted conception is shaping the meaning of family and kinship for millions of Americans who have benefitted from sperm, egg, or embryo donation. "The fertility industry does not provide families with information about 'genetic relatives', yet changes in the Internet and social media have made it easier for people to find one another," said Hertz. "Our work explores what has happened as a result of these social and technological developments and how these donor sibling networks—as we are calling them—meet, stay in touch, and form social relationships out of shared genes." The project, called Social and Bio-Genetic Factors of New Forms of Family, utilizes hour-long, in-person interviews, with the goal of collecting data from various regions of the United States. Since 2014, the research team has completed nearly 300 interviews, in 20 states, some via Skype or FaceTime. The team includes Hertz’s co-principal investigator from Middlebury College as well as Wellesley and Middlebury students. While much work remains, the research has shown that families acknowledge or incorporate donors into their lives in a variety of ways. In some donor sibling networks, for example, parents who used donor services are closer to other parents who share their donor than their kids, who are biologically related, are to one another. In other networks, parents have no contact with each other, yet the kids text daily and refer to each other using sibling terms. Other children meet their donor siblings once and find that satisfies their curiosity. "We’re not sure yet why some networks are more cohesive than others," said Hertz. "We are interested in learning answers to a range of questions about who people consider part of their family." 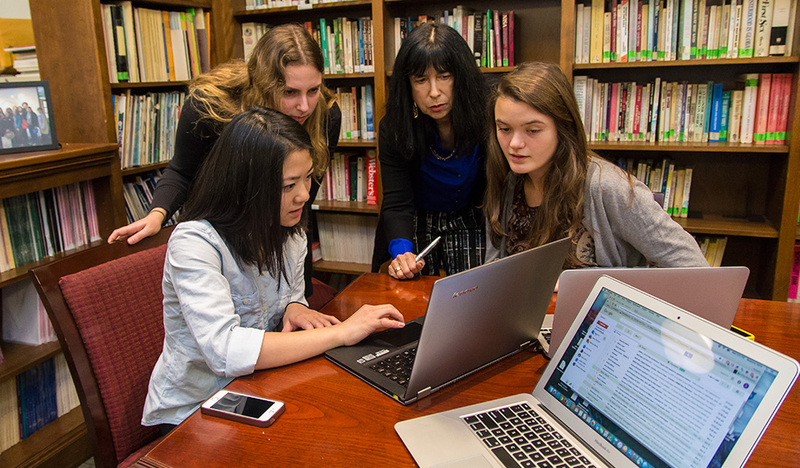 When Hertz was writing the grant proposal, she knew that her Wellesley undergraduate researchers, who are funded through Research Experiences for Undergraduates (REU), would be crucial to the project’s success. "Younger respondents—especially pre-teens and teenagers—are more willing to talk with someone they view as being like an older cousin who lavishes interest and attention on them," she said. "Our research assistants' age more readily dismantles the power differentials between the respondents and the interviewers." Hertz has trained six Wellesley researchers to code the interview transcripts and analyze data, and to interview children while being sensitive to their feelings about being donor-conceived. Hertz also holds a two-hour weekly staff meeting, where the research assistants "often report new connections between issues that I did not see at first," she said. For example, Jackie McGrath '17, a women's and gender studies major, has noticed how little political attitudes factor into people’s beliefs about the importance of genes. "Of course, this is still being tested, but it’s a great example of where we discovered something different than we thought we would find," said Hertz. McGrath, who will work at the State Department next semester, has enjoyed the research experience. "I have been really lucky to be able to interview donor-conceived children—it has shown me a more human side of sociology. I have learned a lot about how asking the right questions can make an interview great," she said. "It's amazing how open the families have been with our research team." Hertz’s two other researchers this semester, Jamie Yang '17 and Rebecca Schwarz '16, have also made important contributions and will continue with the project next semester. Schwarz, a sociology major and economics minor, is using HyperResearch, a qualitative software program, to look at patterns across the transcribed interviews and has already created summary statistics. Yang, a mathematics major, has developed a presentation with Hertz for the annual Eastern Sociological Conference in the spring. "This research is crucial because more and more families are looking to donor assistance," said Hertz, who recently received additional REU funding that will enable her to train more students. "I have always wanted to be able to teach qualitative research intensively through real projects, having students learn all aspects of the research process, which takes more than a semester to complete. This has been a dream since I came to Wellesley, and I am delighted that the NSF has made it possible."